Their trade for Martellus Bennett feels like a good, exciting move for the Patriots, who haven’t had a second real pass-catching tight end since Aaron Hernandez, and who figure to enter this season with one of their more offensive-minded teams in a few years. Even better for New England’s Super Bowl hopes, Bennett came cheap. 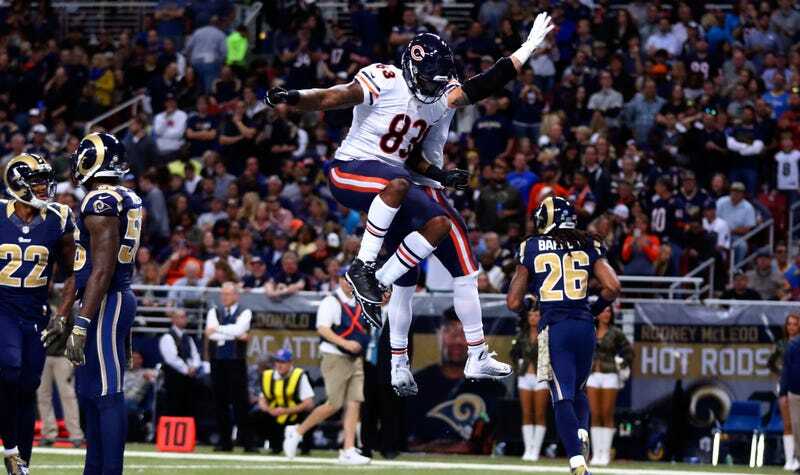 The Bears sent Bennett along with a sixth-rounder to the Patriots in exchange for a fourth-round pick. That doesn’t sound like much for a 29-year-old just one year removed from a Pro Bowl season, but from all accounts, it sounds like Chicago was getting fed up with Bennett. Bennett skipped last year’s offseason program in an attempt to get a new contract, which is his right, but is relatively rarer for players with multiple years left on their deals. Trading Bennett frees up nearly $5.2 million in cap space for the Bears, who certainly were just about ready to move on from him once his contract was up after the 2016 season, so why not get something for him now? The deal makes sense for Chicago, and it makes a ton of sense for New England, which, thanks in large part to injuries, didn’t offer Tom Brady much in the way of weapons. With the return of a healthy Dion Lewis, the signing of Chris Hogan, old standbys Julian Edelman and Danny Amendola, and the tight end twosome of Gronk and Bennett, Brady will have options. That tight end pairing is an intriguing one. The Patriots offense was never so deadly as when Gronkowski and Hernandez were both receiving threats, forcing opponents to use linebackers in coverage or switch to nickel with a third safety, which frees up space elsewhere. Bennett’s presence will also allow to Gronkowski to serve as a blocker without giving up the threat of a pass to a TE, and we know Bill Belichick is enamored with Gronk’s blocking. The upside is considerable, especially with Bennett in a contract year and young enough for one more big payday on the other side. The downside is related: he’s playing for a new deal, and he’s already shown that he’s not happy if he’s not getting looks in the red zone, and now he’s playing with Gronk. I think this move plays out well for the Patriots, who know they have to build around Brady because he’s not going to be great forever, but at the very least, they’re not wagering much.